OECD Home About the OECDOECD Secretary-GeneralWomen: the future of our economies? We celebrate today the 100th Anniversary of the International Women’s Day. This is an important day. This is also a good opportunity to reflect on progress achieved in the last 100 years, and on the road forward towards equal opportunities. Tremendous progress has been achieved. At the beginning of the last century, our grand or grand-grand mothers did not have the right to vote, except in New Zealand and Australia. They rarely attended superior education. Well-off ladies did not work, but the vast majority of ones who worked did so in dreadful conditions. To fight for shorter hours, better pay and voting rights, 15,000 women marched through New York City in 1908. They were pioneers. Since then, the International Women’s Day has always been an opportunity to campaign for women's rights to work, vote, be trained, to hold public office and end discrimination. Now, in OECD countries and many others, women do vote; girls have better education achievements than men; women have the same labour rights; they now account for 40.5% of the global labour force and 61% of women are in paid work on average in the OECD; finally, a growing number of women hold public offices. Yes, we have women Heads of state or government on all continents. And we even have women astronauts. But we are not there yet. We should not forget that in too numerous countries, girls still don’t go to post-primary schools; women still don’t have the same legal rights; they don’t have the same access to public services and are prevented from participating in politics. Worse, in too many places, women remain deprived of basic rights. First, the right to live, with the millions “missing girls” in Asia. Then the right to live in dignity, denied to the thousands of victims of sexual assaults or slavery as a war tactic, or of enforced prostitution. But even in our developed and rich countries, have we achieved equality in opportunities? No. We are not there yet. And there is a lot of evidence to support that. No, women are not equal on the labour market. No, women are not equal in entrepreneuship. No, women are not equal in politics. Women spend twice as much time as men in unpaid caring activities. Women are still under-represented in key education fields such as science, technology, engineering, and mathematics. Women are less likely to work for pay, tend to work less hours, have lower hourly wages, are concentrated in less well-paid sectors, etc. They are also less likely to reach decision-making positions, in either public or private sectors. In politics, women still hold only 20% of seats in Parliaments; only a very few country show parity in their governments; and only 15 women are Head of states or governments. The bottom line is: the gender issue is not solved. Gender equality is not achieved. But why do we care? Why do we need to change this? It is for sure a moral imperative. My daughters are as smart, hard-working, talented, and ambitious as my sons. They deserve to get the same opportunities. It is just blunt evidence. But it is also an economic necessity. There is an economic case and a business case for women equal opportunities. Gender inequality is detrimental to the society as a whole. It is detrimental for the strength of our economies. Greater economic opportunities for women would raise the overall level of human capital and labour productivity. Indeed, recent research shows that a equal male- female distribution would be ideal to foster innovation in business. Greater economic opportunities would also bring more women into the labour force and help address the ageing population challenge. In a nutshell, greater gender equality would lead to stronger and fairer growth. As we confront the scars of the financial crisis and search for new sources of growth, we cannot waste women’s potential economic contributions. How to achieve this? How can we trigger and support progress? Gender inequality in economic empowerment has many different roots. For sure, the role of culture and social norms is important, as shown by our SIGI Index. But inequality also stems from economic incentives, laws and regulations. And we can impact and influence on those. This is even our main raison d’être at the OECD. Let me mention a few areas where better policies could lead to better equality, thus better lives for all. First, let us look at education. For sure, gender parity in enrolment has been achieved in most OECD countries, and is approaching in many others. And girls outperform boys in primary, secondary and tertiary education in most of our countries. But there is a persistent gender bias in the choice of disciplines. Girls don’t go in scientific careers or engineering, the ones with higher returns. And this gender sorting starts very early on. Why so? It is difficult to separate innate from learned behaviours. It is also tricky to evaluate to which points behaviours and cognitive differences are influenced by stereotypes. But the effect is very clear. This will hinder women’s careers, lower their future earnings levels and deprive our economies of a new source of innovation and competitiveness. Second, let us look at employment. It is necessary for public policies to help women, and parents in general, to combine employment with parenthood. This is possible. Female employment does not have to come at the cost of fertility. Staying out of the labour market is not a first-best choice for most mothers. It is rather a choice dictated by a labour market that does not afford to have a family and a rewarding career. It is also due to different treatment on parental leave or tax treatment, and lack of affordable and good-quality child-care. Women want to have “babies and bosses”. Here progress is slow. Notably due to the fact that women still shoulder a disproportionate part of caring and household responsibilities. But some countries achieve good results. To help women combine paid employment and childbearing, governments can develop comprehensive support systems and encourage more flexible workplace practices, for both men and women. It is also necessary to fight against excessive occupational segregation, which is another critical driver of the gender wage gap. This wage gap is the most persistent form of inequality between women and men. It exists and is persisting in all occupations, skills levels and countries. Moreover, this wage gap is larger in the upper portion of the wage distribution. What does this mean? It reflects the famous “glass ceiling” effect which blocks women’s careers. The cost of this glass ceiling is a huge loss of talent, with all its consequences in terms of economic inefficiencies. Because, believe me, women also want to be bosses. Recent laws in Norway imposing quotas on boards show the growing impatience in front of the slow progress in the last 10 years. In Europe, women hold barely 12% of board seats. Third, women also want to be entrepreneurs. But they are twice less likely than men to do so. And if they do, they will grow slower, have less access to capital, own smaller firms, etc. This is a formidable and untapped source of economic growth. Which country can afford to neglect it? To sum up, I don’t know if “la femme est l’avenir de l’homme”, as the French sing, but women might well be a very important part of “the future of our economies”, the most affordable and available new source of growth. This is why, at the OECD, we have identified gender equality in economic opportunities as a key priority. It is no coincidence that the increased importance of this topic coincided with the arrival at the OECD of one of the most well known thinkers and doers in this area, and I am very pleased to have her joining us today. Indeed, I want to thank US Ambassador, Karen Kornbluh, for her strong leadership in this field. Since she arrived in Paris, she has constantly been pushing for such work, lobbying for it, supporting it and now also generously contributing financially. Gender equality has always been close to your heart, and central in your work. It is also close to our hearts and needs to become closer to our brains. This is why I would like, on this very special day, to announce our Gender Initiative. We already have a number of fascinating projects on gender, such as our GENDERNET, our WikiGender or our Women Business Forum in MENA. We want now to mainstream all this work, drawing on the expertise of all our directorates to strengthen gender equality in economic opportunities. We are working on these three dimensions of gender inequality which have a crucial impact on economic opportunities for women: Education, Employment and Entrepreneurship, what I call the three “Es”. We will investigate the persisting barriers to gender equality. We will also propose policy recommendations to reduce the gender gap. And, very importantly, we will develop indicators to monitor progress. Crucially, we will cover not only OECD countries but also emerging economies, even though data is scarce. This will allow us exchange good practices. The early results of our work will be part of the upcoming Ministerial Meeting of the OECD, chaired by the US, in which we will also celebrate our 50 Anniversary. 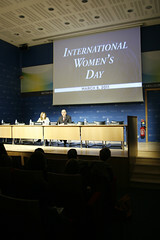 Ladies, dear Ambassadors, colleagues, I wish you all the best and success on this International Women’s Day.